Send your speed results stats to whatever sever you want just clicking one button. As you may know, some sites have promoted speedsurfing emulation by recording speed results on a database for one or two years. We can mention the dutch windsurfing.nl forum or the french "Hall of fame" from windsurfing33.com (no longer in use). Then came www.gps-speedsurfing.com, mainly devoted to this purpose. In the past, to send your data, you had to do some handwork writing a message in a forum, an email to a webmaster, or filling a form. You must use GpsAR 2.3 release (or higher). Open the conf directory, and edit the xml file named servers.xml with a text editor (for instance notePad). In this file, you can add as many servers as you want. For each of them, you just have to put a Login and a Password. If you wish, in the future, you'll have the possibility to set more servers, so that your data will be sent to all of them. To do this, you just have to add this new server and your name and pass for this server in the servers.xml file. See the example below where we added a new server (it appears here in red color). Important: UserLogin and UserPass are independant from one server to another. You may use different names and pass in the different servers. Each time you load a track, analyse it, clean it (deleting spikes), you then can send you data. Go to the "VirtualRun&Stats" menu, and click on "send results on the web". The data will be sent to all servers you specidied, within seconds. Which servers provide this service? 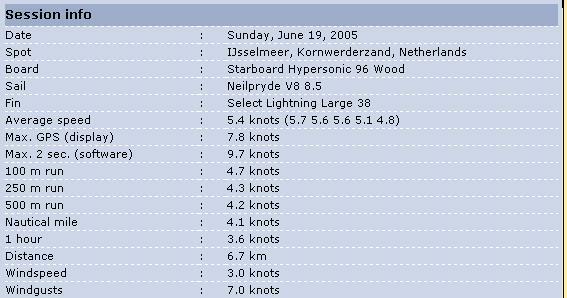 As mentioned, at the time this is written (mid-june 2005), one first Web site provides it: gps-speedsurfing. At least another one is being built, for more local purposes. I will refer here all sites that provide it, as soon as available. How can my web-site can provide this service? A demo server written by Fred Dessurget from Noumea is available for everybody who would like to provide this service in his Web site, and it is promising. Please have a look to http://nowhereman.no-ip.org/xparse/brauzeur.php (click on the "Map" links : you'll see where the results come from on a world map). All data you'll see there is real data sent from GPSAR. 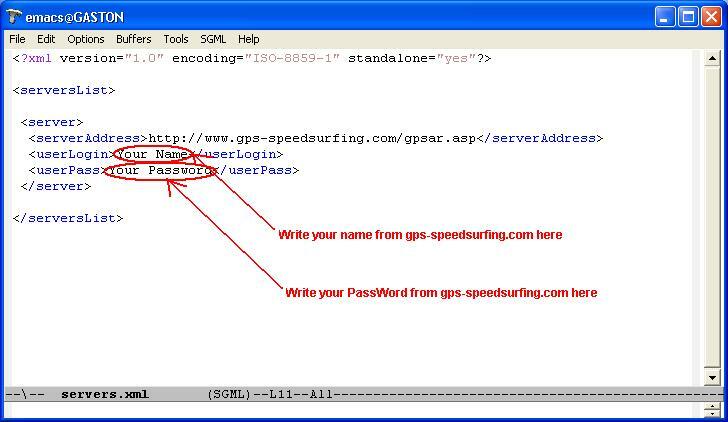 Add this server to your servers.xml file (with the correct Login and Pass of your new account). You can then check your results appear here. Fred provides the PHP code to everybody requiring it. GPSAR send to the server(s) speed data as you can find in the statistics results. The only "personal" information that is sent is a LOGIN and a PASSWORD. These two values are shared between YOU and the SERVER you send your data to. There one LOGIN and one PASS for each server you choose, that can be different. Hence, the webmaster from www.site1.com won't know the login and pass you use on www.site2.com (except if you choose to use the same on the two servers). For webmasters using a PHPBB forum, it is possible to use the same Login and Pass as in the forum. You'll just have to add a md5 function to script the pass provided by GPSAR (Fred's code includes this point). Hence, any forum user is ready to use the send-data fonction. Note that no other information is transmitted to the servers. Finally, the fact that GPSAR is able to send you data to several servers in one time allows for example you send your data to, say, gps-speedsurfing.com, so that everybody in the (speed)world can see your results, AND to a local server from you club or your region, etc.